This soft plush elephant shaker rattle provides comfort to babies and play activity for babies. 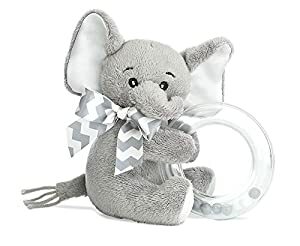 This baby rattle is sure to become baby's favorite. Measuring 5", this rattle is the perfect size for baby to hold. Made by the Bearington Baby known for their outstanding quality and fine fabrics. Gives you the assurance that this will be one that is treasured for years.